Rhode Island Plastic Surgeon Returns from Delivering ASAPS Lectures on Achieving a Natural Appearance - Patrick Sullivan, M.D. Providence, RI — At the recently-held annual Aesthetic Meeting 2012 for the American Society for Aesthetic Plastic Surgery (ASAPS), Dr. Patrick Sullivan, a plastic surgeon in Rhode Island, delivered several lectures on cosmetic enhancement surgical techniques. The 45th annual event took place in Vancouver, British Columbia at the Vancouver Convention & Exhibition Centre from May 3-8, focusing on the latest advancements in aesthetic procedures and technology. Having now returned to his Providence plastic surgery practice, Dr. Sullivan says he was honored to participate in the event and hopes his presentations resonated with attendees in a way that will help promote the future of plastic surgery. He says involvement in the ASAPS event has given him an opportunity to pursue one of his greatest passions: teaching other surgeons how to create natural results with plastic surgery. “We need to deliver results in plastic surgery that can achieve very significant improvements and yet are still natural. An operated appearance is bad for the patient and bad for plastic surgery,” he says. The 2012 Aesthetic Meeting for ASAPS featured over 200 scientific and technical exhibits, hands-on cadaver workshops, and live demonstrations to help surgeons and practitioners in attendance familiarize themselves with the most state-of-the-art cosmetic techniques available in the industry. Dr. Sullivan says he is always eager to participate in events such as the ASAPS meeting because they offer him an opportunity to share his methods of patient evaluation and individualized treatment in an effort to provide the best possible care for patients who desire plastic surgery. 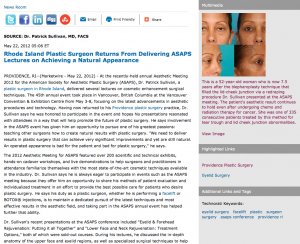 He says his duty as a plastic surgeon, whether he is performing a facelift or BOTOX® injections, is to maintain a dedicated pursuit of the latest techniques and most effective results in the aesthetic field, and taking part in the ASAPS annual event has helped further that ability. Dr. Sullivan’s recent presentations at the ASAPS conference included “Eyelid & Forehead Rejuvenation: Putting it all Together” and “Lower Face and Neck Rejuvenation: Treatment Options,” both of which were sold-out courses. During his lectures, he discussed the in-depth anatomy of the upper face and eyelid regions, as well specialized surgical techniques to help enhance results of eyelid surgery by improving eyelid appearance, reducing or eliminating lid cheek junction abnormalities, and improving skin texture. “Using these specialized eyelid rejuvenation procedures, the incisions are hidden on the inside of the eyelid, so they are not visible to the naked eye, and give the impression of a ‘scarless’ surgery. For many patients, having the right procedure designed specifically for his or her unique anatomy can bring about a dramatically improved appearance. Also, in many situations, patients can often have a great result with a more minimally invasive procedure,” he says. Dr. Sullivan’s discussions also focused on how to establish facial contours that blend the jawline, with the neck and how to diagnose and account for crucial neck deformities that could impact the desired outcome. “Effectively removing the jowls, double chins, fatty collections, and excessive skin can be particularly helpful. But when combined with artistically appropriate fat injections, the results can be both dramatic and natural,” says Dr. Sullivan. He also says there are two key elements involved in achieving an exceptional result with the face: tailoring the treatment plan to both the individual’s needs and anatomy, and avoiding visible scars in the facial area. “Skilled artistic analysis of each patient’s face is paramount in determining the procedures from which they will benefit most,” says Dr. Sullivan. Regardless of whether patients are looking for a facial procedure or breast augmentation, Dr. Sullivan says keeping up-to-date with relevant and accurate information as a plastic surgeon is an essential indicator of his or her passion for patient care and dedication to the highest quality results. He says he strongly encourages patients to take their plastic surgery decision seriously and conduct extensive research through several outlets, including consultation with a board-certified, actively educated plastic surgeon. Putting in the time and effort on the front end, says Dr. Sullivan, will ensure patients receive the best possible outcomes. Dr. Patrick Sullivan earned his medical degree from the Mayo Medical School in Minnesota and completed his surgical residencies at the University of Colorado and Brown University. He is dual board-certified by the American Board of Plastic Surgery and the American Board of Otolaryngology, as well as a Fellow of the American College of Surgeons. Dr. Sullivan now serves as a faculty member at Brown University’s School of Medicine and has been named in Woodward and White’s “Best Doctors in America” as one of the “Top Plastic Surgeons.” He has also been named in the Castle Connolly Guide to “America’s Top Doctors” and “America’s Cosmetic Doctors and Dentists.” Dr. Sullivan regularly presents his research before meetings of the American Society of Plastic Surgeons, the American Society for Aesthetic Plastic Surgery and the American College of Surgeons. Located at 235 Plain Street Suite 502 in Providence, RI, Dr. Sullivan’s practice can be reached at (877) 435-3223. It can also be contacted online via the website drsullivan.com or Dr. Sullivan’s Rhode Island plastic surgery Facebook page.